We are big fans of "BIG" yet, balanced wines. With our wines, Longfellow looks to produce wines that have deep color and concentrated layers of aromas and flavors yet are balanced from start through finish. Our goal is to produce wines that will get better over time, but ones that you will be talking about after dinner and tell your friends about the next day. Our small varietal production allows Longfellow wines to be truly handcrafted from vineyard to bottle. Every aspect of the winemaking process is directed to produce wines true to their varietal heritage, but unique expressions of the vineyard and climate where they were grown. As with all exceptional wines, the quality starts in the vineyard. With the Longfellow label, we committed that for each varietal, if high quality fruit could not be procured, the wine would not be made. Our ultimate case production will depend solely on the ability to source grapes from extraordinary vineyards. In pursuit of this goal, we have forged relationships with growers who are the foundation of our commitment to quality. Kale grew up in Sonoma County where he was exposed to the wine industry through a community that encouraged creativity, a love for the outdoors, and faithful stewardship of the land. 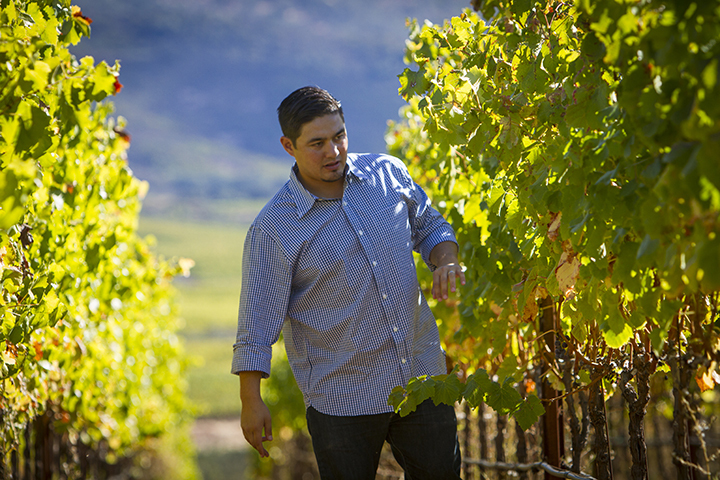 He graduated from the University of California, Davis with a degree in viticulture and enology. After graduation, Kale went to work for Ann and Joe Wender at Colgin Cellars and after stints at Terra Valentine and Cliff Lede in the Stags Leap District, he became the Director of Winemaking at Pahlmeyer. At Pahlmeyer, Kale was able to mature and grow as a winemaker and became the one of the youngest winemakers in Napa to earn a 100 point score from Robert Parker for the 2013 Pahlmeyer Cabernet Sauvignon Piece de Resistance. After five years at Pahlmeyer, Kale decided to focus on his own label of wines and consult for small limited production projects like Longfellow. Kale is seen as a rising star in the Napa winemaking scene and we are very pleased to have him further developing and honing the Longfellow style of wines. His energy and passion for only making great wines and sweating every detail are the foundation for the Longfellow project. Longfellow is very fortunate and proud to have Kale Anderson as its winemaker. Kale is the new foundation of the Longfellow winemaking philosophy. He shares our singular goal of only producing exceptional wines of unique character from unique vineyard sites.